Covent Garden is one of London’s main traditional shopping precincts, with the Covent Garden Market building itself, once London’s main wholesale fruit and vegetable market, now full of boutique shops. The historic market building is in the heart of London’s “theatre-land”, and is bookended by a grand Apple Store and the Royal Opera House on one side, and the London Transport Museum on the other – the latter is itself a fantastic source of old London maps. Compared with Oxford Street or the Westfield malls, two of London’s other main shopping districts – it’s just as busy, but with the lack of large department stores or standard chain shops, it has quite a different feel. It’s rather pleasant in fact, as long as you don’t mind crowds and tourists! 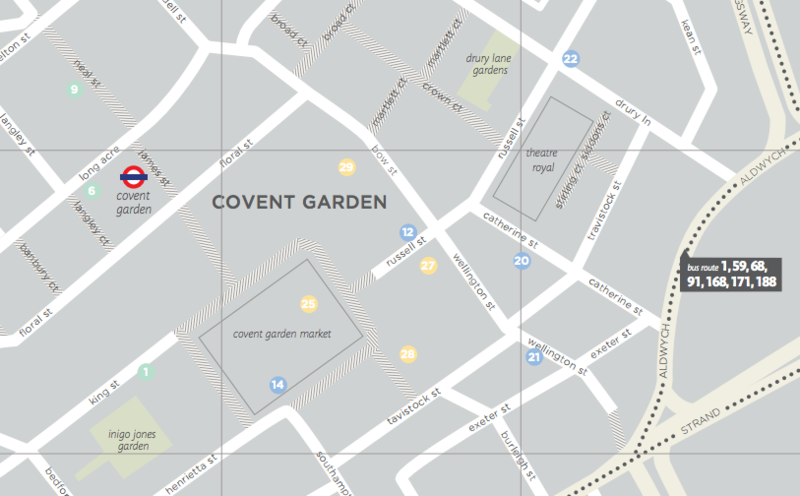 Urban Walkabout, who we’ve featured before with their Clerkenwell/Farringdon map, recently published their latest map, focused on Covent Garden (extract below). 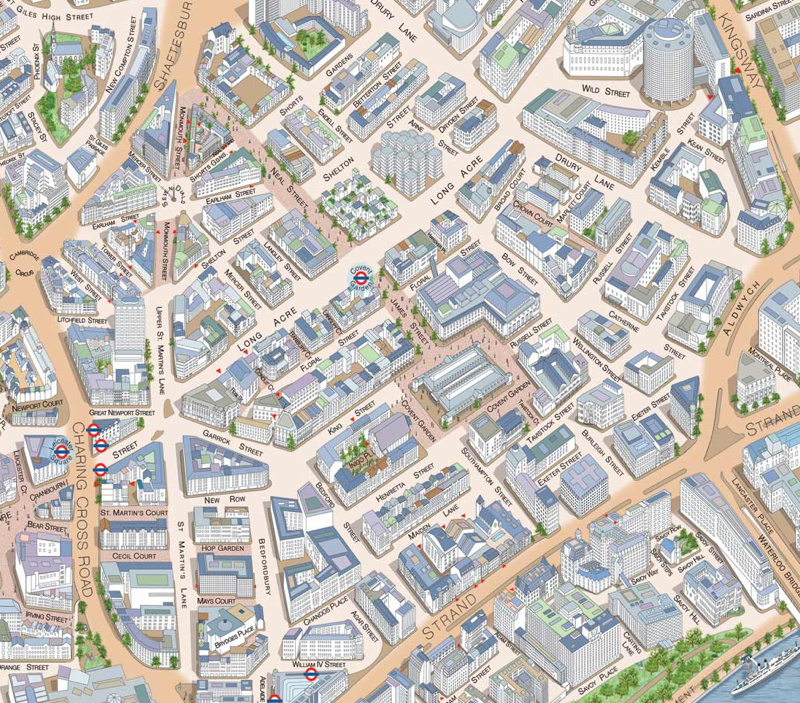 Like their other maps, it has a pastel style, and highlights many of the independent shops and businesses in the local area. Derek Reed at Silvermaze produced this pleasant isometric 3D-effect map of the area several years ago (extract at top) – and have slowly extended it to cover a wider area – it now stretches from Marble Arch to Waterloo. The style of the buildings shown reminds me of the SimCity game. It’s a nice hybrid of modern, functional maps, and old-style maps with trees and boats drawn in. The streets are widened compared to reality, which aids clarity – so you have both a clear view of the building shapes, and of the street network. 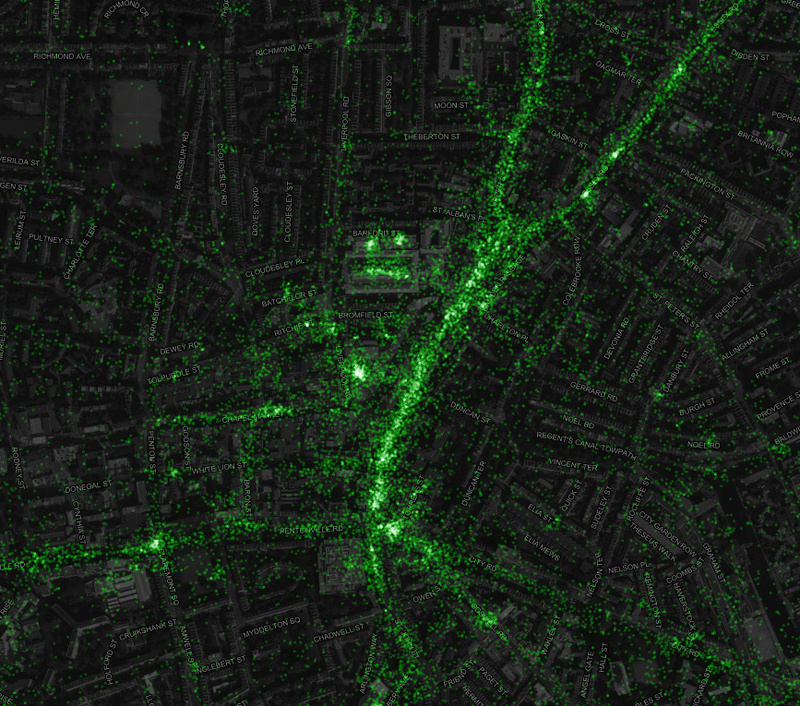 There’s a number of versions of the map around – here’s another. Finally, we found this nicely done, modern isometric map, produced by CapCo, owners of the market and several buildings surrounding it. 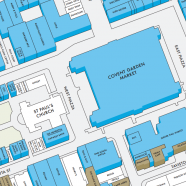 Here’s another version on their website, which includes detail of the traders in the market itself. Coloured buildings are the ones owned by CapCo, with the ones in dark blue or brown (depending on the map version) being places to eat and drink in. The leaseholder of the market, the Covent Garden Area Trust, pays an annual rent of a red apple and a bouquet of flowers to the owner.